“Goodbye, Garrett!” I exclaimed after our weekly play therapy hour, which included singing Garrett’s favorite songs-“The Wheels on the Bus” as always a particular favorite. Garrett, a non-verbal eleven year-old boy with autism and Down Syndrome, would clap along. But this particular Wednesday afternoon was different. As I waved goodbye, he said for the first time, “Bye, Judia.” “Close enough,” I joyfully thought. His mother audibly gasped and looked from me to him. “That’s the first time he ever said anyone’s name!” she whispered. Leaving that day, I understood again that I need not only be the recipient of kindness and assistance, but I can also be the provider. "Life isn’t about waiting for the storm to pass. It’s about learning how to dance in the rain." I have looked at this quote every day for fourteen years. This may seem odd, as I am a girl for whom dancing is an unlikely pastime, or at least dancing without my ever-present Lofstrand crutches. My mother probably put it there to inspire me to attend to my physical therapy more enthusiastically, but the quote did more than that. Garrett saying my name helped me again realize what “dancing in the rain” really means: to find the positives within the negatives, often with the help of one’s personal umbrellas. But it has taken me a long time to learn about dancing in the rain, and I am still learning, because for many years the rains came long and hard, and I have had to depend on umbrellas to get me through - people like my parents, my physical therapist, and my friends. My fourth of eight surgeries, which rotated my errant hip back into the socket where it belonged with nine titanium screws, stands out the most. I thought it would eat my summer with its giant mouth of pain and boredom, but umbrellas came. My friends kept me company while I painstakingly healed in my mom’s office, unable to ascend the stairs. They painted my toes, and when I was feeling grimy from not showering, they gingerly wheeled me out to the summer-steamy deck. They hosed down my stinky, sweaty body. Laughing along with my beautiful parasols, I did get some summer. A few years later, during my internship at the Isla Vista Youth Project, I worked in a toddler room dedicated to serving working families, many who struggle to survive on inadequate wages. One boy, Damian, grabbed a book and ran to me every time I walked in. As I read stories I thought about the social inequities they didn’t even know yet that they faced. I wondered how I could help these children reach their highest potential as people in my life have helped me to do. I am not sure if I made a lasting impression on them, but they surely did on me. They reminded me of something I had first discovered through my work with Garrett, the value of helping others learn to dance in the rain. The importance of umbrellas keeps emerging in my life, as it did at a hospital where I currently work in the psychiatric department. Candidly, I was scared on my first day. As I entered, I heard patients crying from their beds. Then I met Sharon. Over checkers and canasta, I learned about her own set of formidable challenges. She has bipolar disorder and has suffered the loss of a child. There probably isn’t an umbrella big enough for that, but I hope that my visits provide momentary breaks in the clouds. When Sharon says, “Will your mom be mad if I steal you?” I think maybe they do. Dancing in the rain will look different for different people. Garrett’s dance is different than Damian’s dance, which is different from Sharon’s dance. My dance has been about graciously receiving help while joyfully giving it. It has been about cherishing my many umbrellas even as I hold one out over others. I mean to make it my life’s work. As a psychologist, I hope to help other people learn their dances. Everyone should have opportunities to dance in the rain, whether it is a samba or a simple box-step. My sticky hands scraped against the table, struggling to grab a napkin, yet my scrawny eight­-year old arms were not quite long enough to reach the pile. Looking around Cracker Barrel, I saw a variety of people: typical families with kids outnumbering the parents, young couples eating breakfast after church, college girls laughing loudly, and an elderly woman alone in the corner. I saw my mom subtly gesture to the little, old lady I noticed before. Her head swayed over her food as she cut into her pancakes, pouring her syrup on with an unwavering aura of solitude. In minutes, we paid for our meal and hers. Not only did I have butterflies in my stomach, but the entire zoo as well, as I realized that my mom made that woman’s day. As we pushed the heavy, wooden doors open to leave, I left with a full stomach and an impression of a lifetime. Today, I volunteer endlessly through many organizations such as the Dream Team, a group that raises money locally for childhood cancer. I participate in about every club or activity in my school, mentor younger kids as a Big Sister, and spend my extra time working in a local nursing home. That memory of kindness had imprinted itself on me, and pushed me to change the lives of others. Deja vú struck as I sat in a booth at Red Lobster, on a busy Thursday night. Eating my New England Clam Chowder, I couldn’t help but notice a woman, sitting alone eating her lobster. Like Cracker Barrell, the overwhelming feeling of loneliness poured off of her, tugging on my heart strings. I noticed my sticky fingers, and reached across the table, finally able to grab the napkin I remembered from so long ago. Quietly, I whispered over the table to my friend, “We should pay for that lady’s meal.” Nodding in agreement, we signaled our waiter over. In minutes, we paid for our meal, as well as the woman’s in the corner. It was then that it struck me that spontaneous acts of kindness make the biggest differences. Paying for the person’s coffee behind you in the drive­through, or helping someone carry in a big pile of books shows love for others in need far more than signing up to volunteer so you can put it on your application. As someone greatly involved in my community, I spend many hours giving back to my hometown. Through all of this, however, I realized that genuine kindness cannot be premeditated; it is the moments in which we are least expecting when it strikes, forever leaving an imprint on us and those that it affects. I pushed open the heavy, wooden doors to Red Lobster, and this time, I was truly full. A little girl went to Disney World with her grandmother. Upon entering the park, they were approached by a security guard. 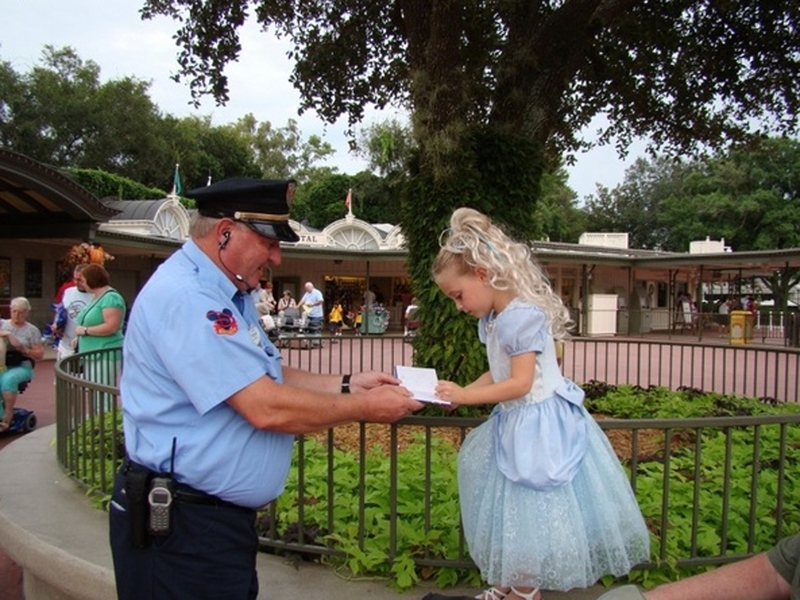 The guard, pretending to mistake the girl for the real Cinderella, asked for her autograph. The little girl's face lit up with joy and a giant smile spread across her face. The security guard, Freddie Wieczorek, has been “mistaking” kids for the character they are dressed up as for the 4 ½ years he’s been working at Disney. In that time, he has collected nearly 1400 autographs from kids. Wieczorek says he does it because it makes the kids happy, not just in that moment, but for the rest of the day. For this one little girl, she felt special for the rest of the day and this is a story she will never forget. Since I heard this story, I have tried to do things that make other people happy. I’m not afraid to compliment someone on their nails or outfit because I know they will feel good about themselves afterwards. I volunteer at my local hospital. Whenever I deliver flowers or a book to a patient, I try to think of things I can do while I’m with the patient that would make them happy. Sometimes this is as simple as plugging in their phone. Other times I sit and talk to them for a while. Whenever I leave the patient's room, I try to make sure they are smiling. This not only makes the patient happy, it makes me happy. I enjoy being able to brighten up someone else’s day. That is the reason I started volunteering at the hospital to begin with. The impact of what that security guard did has gone far beyond that little girl. It has been spread around the world and inspires people to be kind to each other. At 23 weeks pregnant, I woke up terrified as I discovered that I was lying in a pool of blood. I was in labor four months before my due date. My husband was left behind as I was airlifted by the Coast Guard from our Alaskan cruise. Both mine and my unborn son’s life were inevitably on the line as I continued to bleed. I was transported to a small hospital in Sitka, Alaska. “You can’t deliver your baby here. Our equipment is not small enough for a baby that weighs less than a pound, and Honey...” she paused abruptly, while shaking her head. We listened quietly as the heartbeats on the monitor slowly faded away. I thought I lost him until I felt a faint little kick. Suddenly, I began hemorrhaging and the entire hospital staff stepped in to attempt to, somehow, stop the bleeding. “We need to get you to Seattle.” the nurse said without hiding her fear for our lives. I had already known that my son’s chances for survival were about 17%, not including all of the other severe, life-threatening complications that accompany being born four months early. But I couldn’t allow this to be my focus. I tried so hard to find something else to focus on but I couldn’t seem to escape the reality of this terrifying tragedy. Another nurse named Vicki looked over at me with compassion. Her heart visibly ached for me. She approached me and with deep sincerity handed me a beanie she hand-knit for her patients. “When Malachi is big enough to wear this, I want you to send us a picture of him in it.” I was given a piece of hope that I could hold in my hands at a time when no words would bring comfort. I clung onto that beanie with all the strength I could muster in hopes that someday, my son really would be big enough to wear it. That beanie became my main focus. After being transported to a larger hospital in Seattle, I was told that every day I remained pregnant meant three less days for my unborn son, Malachi, in the NICU. I kept that beanie right next to my hospital bed so that I could try to focus on his small chances of survival, regardless of the unlikelihood. This beanie was something I could look to and physically grasp for comfort in a time when I felt utterly hopeless. 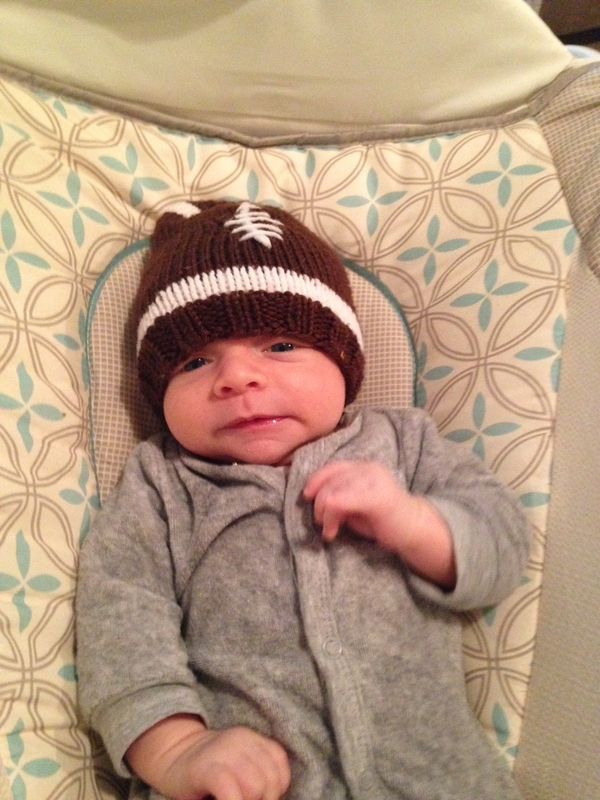 I focused on what my son would look like wearing this beanie as I tried to imagined his features. Would he resemble my husband, with his dark, wavy hair? Or would he take after me by having straight, blonde hair? Would his eyes be a deep hazel? Or would they be bright blue? With every day that passed, this beanie served as a constant reminder of how far we had come. Slowly but surely, those days turned into weeks and weeks into months. Malachi defied all odds and I was able to remain pregnant for another fifteen weeks. Finally, the day that I thought would arrive too soon came at just the right time. The delivery room crowded with many of the nurses and doctors who had been caring for me all of these months. They were rooting for me. In this moment, they had witnessed an absolute miracle. Malachi was born perfectly healthy and I delivered him at full-term. A few weeks after arriving home, I came across something that made me cry as I remembered everything that had happened. It was that piece of hope that was given to me. The very thing that became my focus while being told that the chances of Malachi's survival were extremely low. It was the beanie that I never imagined Malachi fitting into. I picked it up and looked at it. As tears streamed down my face, I placed it on his head. Not only was it able to fit, but it was already slightly small. "We did it, Malachi." I said as he looked at me with curiosity and wonder. This experience instilled a deep desire within me to pursue my dream job by becoming a nurse. A passion that stems from the knowledge and experience as a long-term patient. All thanks to a nurse named Vickie and a little beanie that was hand-made with love for my blonde-haired, blue-eyed little miracle that I am so thankful to have and to hold. I blink. In a fog, I open one eye seeing the yellow textured wall around me. The smell is familiar. Thoughts race through my mind as I inhale the noxious stench of antiseptic. My memory starts to come back. I look down at my arm, wrapped in gauze from my wrist to my shoulder. Here I am again. Junior year is supposed to be a time filled with prom, placement tests, and parties. For me it was filled with white walls, beeping noises, and IV poles, spending six months in and out of the hospital. In October of 2016, I donated blood which resulted in a rapidly spreading infection in my arm. I never would have thought that a small act of kindness would have turned into such a tragedy. When the infection continued to spread and could not be controlled by antibiotics, I was admitted to the hospital, later to hear the word - surgery. This process was repeated time and time again, as the infection went dormant and resurged throughout my body. I traveled out of state and was diagnosed with an immune deficiency, preparing for an invasive operation on my arm. As my arm healed, I started to feel like myself again. The infection had been eradicated from my body, and I was left with the care of the doctors and nurses around me. Not too long after overcoming this hurdle, while riding my bike home from work, I was struck by a car. I suffered a concussion and severe road burn on my entire right side. Within a week my leg was bright red, swollen, and unfortunately infected. For three weeks, I tried everything within my power to stay out of the hospital, but the antibiotics alone were not working. I was readmitted to the hospital, and had four more surgeries to remove necrotic tissue in my leg. However, I met an incredible surgeon who changed my life. She implemented less invasive techniques which had never been used before, and the result has been better than I could have ever imagined. I am finally recovering and will have only a few small scars. She went out of her way to research methods that would keep me comfortable and at home, while my condition improved; all along the way she considered my feelings, never leaving my side. Along this bumpy road, I met nurses who also gave me hope. They treated me with kindness and respect, creating an environment that felt like home. They tirelessly tried to keep a smile on my face, even though I was living in a hospital bed. One nurse, Joe, had an even greater impact. From the most painful days to the better ones, he was there for me. He would study with me on biology homework, and was the person that bridged the confusing gap between me and the medical jargon that surrounded me. And above all else, he was my friend - showing me a side of nursing that I had never seen before. Among the negative nature of my experiences, I gained something even more valuable. I learned that I want to be someone's Joe. As cliché as it may sound, I want to be the one who makes a difference for people just like me. Sometimes life can get messy; and unfortunately, people can experience trauma along the way. I want to help ease someone's suffering, just like Joe helped me. My numerous surgeries have left me with scars, both physical and emotional - which I am still working hard to overcome. However, with the support I've had from all my caregivers and of course my family, I know I will come out of this even stronger. In light of the situation, I believe my scars will forever show the struggles of my past, and represent my hope to be part of a better tomorrow. Lately, the topics of terrorism and hate have been prevalent in news reports across the nation. The future is clouded by bleak depictions of selfishness, and kindness usually remains unseen. However, there are still people that are lights in dark times. This wonderful luminescence is seen in a man who pushed an elderly wheelchair-bound man uphill in the pouring rain. The disabled man had been out when the downpour began, and his savior was driving by. Even being a complete stranger, the man saw that he was struggling, stopped is car, and got out to help the man arrive at his destination. Many people would have simply kept driving by, and merely hoped that the man would miraculously get his wheelchair up the hill, through the rain storm. Instead, this man forgot about himself, and thought only of the needs of this disabled man. Even though the conditions were formidable, the man helped. This is so inspiring to me, as it motivates me to be a more selfless person, someone who puts the needs of others above their own, and someone who is willing to stop, and help a mere stranger. I think this story can also be inspiring to everyone, as kindness is contagious. If we all forgot about ourselves a little more often, finding the generosity in our hearts wouldn’t be as difficult, and this world would be a little kinder. If there were ever any one statement that every person knows to be true, regardless of who they are or where they are in the world, it would be that life isn’t easy. Throughout the course of our lives, we all encounter some form of hardship at one point or another. During these times of hardship, the challenges may seem far too great to be overcome, causing us to despair; and yet, even in trying times, a single act of kindness can act as a light in the darkness, guiding us through to better days. In my own life, I have struggled with an eating disorder for several years, and have felt at many points that I would never recover. However, because of simple acts of kindness from my choir director, one of the most unlikely people I know, I was forever inspired to get better and go on to help people in the same way that he had helped me. Out of all of the challenges that I’ve ever had to face over the course of my life, living with anorexia has proven time and again to be the single most challenging and dangerous. When my disease was at its worst, I would spend hours every week crouched over a toilet, desperately trying to make myself throw up every morsel of food that I had eaten that day. Anorexia completely and utterly consumed me, sucking all the joy out of life and bringing me closer to the grave with every passing day. However, despite my disease’s severity, I chose not to reach out to anyone for help; I felt that I was the only person who truly understood my situation, and anyone else being involved would be nothing more than a hindrance. This would continue to be my attitude toward others for several more years, as my condition spiraled continued to spiral even further out of control. In my sophomore year of high school, however, I would join my school’s choir and meet my choir director, a person that would forever change my life for the better. Unlike the other people in my life, he was by far one of the most understanding people to my condition. When other people would make backhanded statements about my weight or appearance, my choir director would simply give me words of encouragement. He was never overly intrusive, but still took the time to show that he cared about me a great deal. Something that most people don’t understand about people with a mental disorder is that we just want to be treated like any other person; we don’t want to be given special treatment or to be thrust into the limelight. My choir director understood this fact and treated me like he would any other student, something that I am eternally grateful for. Because of how he treated me, I didn’t feel as though I was broken; I didn’t feel like an outcast. I simply felt cared for, and it was because of this that I found the strength to continue fighting my eating disorder. Over the years, recovery has undoubtedly been a struggle, but I genuinely do believe that it would have been even more difficult, if not impossible, if not for the love and support that I received from my choir director. Furthermore, not only did his kindness inspire me to get better; it has also kindled within me an intense desire to help others in the same way that he helped me, or even beyond. My choir director was one of the people in my life that inspired me to pursue nursing, even if he hadn’t chosen that career path for himself. To be able to help those in less fortunate situations than myself is something that I want more than anything else in this world. If I can help even a single person in the same way that he helped me, then I can say that I lived my life to the fullest. This being said, my director’s acts of kindness towards me forever inspired me to recover and go on to help others in whatever possible. It’s truly amazing how something so seemingly small as an act of kindness can have such a colossal impact upon somebody’s life. When it initially happens, the person performing the act may think that they’re simply doing someone a favor; and yet, these seemingly insignificant acts can completely change someone’s life. It was because of the kindness and compassion that my choir director showed me that I was able to recover from anorexia, and I truly believe that I may have never recovered if not for his act of kindness. In the second grade we had a bully; he was always bossing people around and was very loud and aggressive. Naturally, I tried to avoid him and stay out of his line of fire, but one day I overheard him talking about how his mom was in the hospital. I told my mom about what I had heard. A few days later my mom asked if I had any update on the bully’s mom, but I didn’t, so she contacted my teacher to see how she could help. It turned out his mom, Cindy, was very sick; she had been diagnosed with tumoral calcinosis. Tumoral calcinosis is an extremely rare and painful side effect of lupus which causes bones to produce excess calcium, resulting in painful bony structures throughout an afflicted person’s body. Cindy had a very aggressive and hard to treat version of this. My mother reached out to the family and started assisting them by bringing home cooked meals, driving Cindy to her doctor appointments, helping with her two sons’ homework, and anything else that their family needed. My family continued to help for many years, as they tried to find and attempt many different treatments and procedures to improve her condition and because of this our families became very close. As time progressed her state slowly worsened as the disease took control, and she had to amputate fingers as well as receive wound care constantly. In the summer of 2015 Cindy took a sharp turn for the worse and it became clear that her body could not survive her tedious and painful condition much longer. She was put on hospice and given 2 months to live and required constant attention and care, care that a working husband and teenage sons could not provide. Cindy’s husband, Oscar, came to our house and broke down into tears while telling us this terrible news. They were looking into various nursing homes when once again my mom stepped in. My mother ensured Oscar that Cindy wouldn't have to spend her final days in a nursing home surrounded by strangers, but at home, with her family and loved ones. My mother personally took over her care, spending long days and night with Cindy, who had been fully handicapped due to the bony tumors all over her body. She could not perform even basic daily functions such as dressing herself, brushing her hair, or eating, so it was up to my mom and the other volunteers she coordinated with to make sure that Cindy was fully provided for. My mom also worked with hospice providers to make sure she had the right medicines and pain relievers so that Cindy could be comfortable. The hardest thing my mom had to do was treat Cindy’s wounds, which was a 4 hour ordeal every 3 days. The doctor my mom worked with said that Cindy’s wounds were the worst he had ever treated, and he had been an army medic on the front lines of the Iraqi war. My mother would always be behind Cindy when treating her, so that she couldn't see my mother crying the whole time. On January 27th, 2016, Cindy passed away peacefully in her bed, surrounded by her family and her loved ones. Had my mom not intervened when she did, Cindy's last months would have been spent alone, but thanks to my mother's sacrifice and act of kindness she was able to see her sons everyday, cuddle with her beloved dogs, Molly and Peewee, and stay in the comfort and familiarity of her own home. In the months that my mother was taking care of Cindy she often wouldn't come home until late in the evening after my brother and I had gone to bed and would turn around and leave before we woke up. She sacrificed spending time with her own family so that Cindy could spend time with hers. Today, almost 2 years after Cindy’s passing, my mom remains close to Cindy’s sons, Justin and Hunter. Justin who is now 23, works for her cousin's company. Hunter will be graduating along side me in June and then plans to enlist in Marines, which was always his mother’s dream for him. My mom made many promises to Cindy and no matter what the toll it took on her, she refused to do anything less than to stand by her word. I have heard my mom say there is power in the word ‘yes’. Confronted with the complexity of caring for someone with such an advanced and complicated disease, Mom often wondered how she could do it. But once she said ‘yes’, the means just fell into place. When confronted with challenges, we can all learn from my mom and just say ‘yes’ to kindness and power through the storm. A galaxy of scars scatters his fragile, little body. Etched next to each scar is the battle of which he survived. An old soul lies in the child's body, one that develops after an individual endures a great number of hardships. He had the blood of a fighter coursing through his veins, which was vital when he was sent on his journey of endless obstacles he had to overcome. But he wasn't alone on his journey. He had captured the hearts of those around him, with his wisdom, his strength, his selflessness, his caring nature, and his mental attitude which made him ready to take on any curve ball life threw at him and to do it with a smile on his face. The community was there for every step of the way, to cheer him on as he conquered each barrier in his path, and when stumbled, they were there to catch him before he fell. This little boy, who rightfully earned the title of superman, had been at war with cancer since the age of 2. After going through treatment which included chemo, radiation, trials, and medications, and he finally beat it, a new patch of the venomous disease would find a foreign place in his body to take refuge. Not only did it strain the boy who had to battle the almost never ending pain of his fight, it also took its toll on the rest of the family. There were always fundraisers and benefits to try to alleviate some of the weight on the family's shoulders. But one of the best acts of kindness done for this family wasn't some organized event that received a lot of attention; it was the action of a young girl with a heart of gold who would receive no glory from it except for the satisfaction of knowing she impacted the lives of others. For her 11th birthday, she didn't create a list of presents she wanted, she instead asked for money as a substitute. With all the birthday money she collected -- which she could have wasted on materialistic objects for herself -- she decided to give the money to the family to help pay for this little boy's treatment. As a little girl, I knew the excitement and bliss that comes from unwrapping gifts on your birthday, so witnessing another little girl sacrificing this experience to give a meaningful, sentimental gift to this family, was one of the most inspiring moments.